Precision Training Medi Kit First Aid Medical Junior Team Kit Touchline Bag Set. Refill for Medi Touchline Bag, Junior MediBag and Medi Grab Bag. 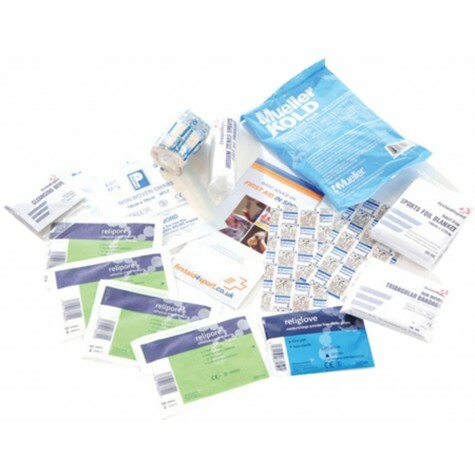 Guidance Leaflet x1 Crepe Bandage 7.5cm x 4.5m x1 Waterproof Dressing IWS (pack of 10) x1 Medium Sterile Sports Dressing 12 x 12 cm x1 Big Plasters 10cm x 9cm (pack of 4) x1 Wound Cleansing Wipes (pack of 6) x1 Nitrile Gloves Medium (pair) x1 Swabs Sterile 10 x 10cm (pack of 5) x1 Triangular Bandage Non Woven x1 Instant Cold Pack x1 Sports Foil Heat Blanket Adult Size x1 Fabric Dressing IWS (pack of 10) x1.